Now, folks, you know I like to eat, and I’m willing to give any place a second chance (unless the first experience is beyond reproach). So, after a not-so-glowing experience at Rancho del Zocalo a few years ago, I decided it was worth a second try. Certainly, it’s a beautiful place — one of the most attractive eateries in the park. Smack in the heart of Frontierland, you also get amazing views of the Golden Horseshoe, the Rivers of America and Big Thunder Mountain. It looks like an old hacienda, beautifully crafted with wide walkways, a large and accommodating patio area. The restaurant is as welcoming as it is charming. At night, it becomes even more attractive, as the lights become subtle and dramatic, bouncing of the stone, stucco, trees and Mexican bric-a-brac in a sensational way. Beautiful! Inside, you’ll find a great set-up, with everything placed where it is easy to see. You grab your utensils when you walk in, go to one of four food stations, and grab your drinks on the other end from a wide selection (both bottled and fountain style). They wisely keep everything streamlined. A lot of thought was put into this place, inside and out. But there is trouble in this south-of-the-border paradise! Immediately, I noticed that all of the spoons they were offering were dirty. Not even two reminders to this major blunder rectified the situation. After ignoring my friend, Loren, for a good spell, the server also forgot what he ordered, as Loren went off to find clean spoons somewhere in this increasingly manic establishment. The server only had 3 dishes to prepare, and the place wasn’t even busy, so there was really no excuse. 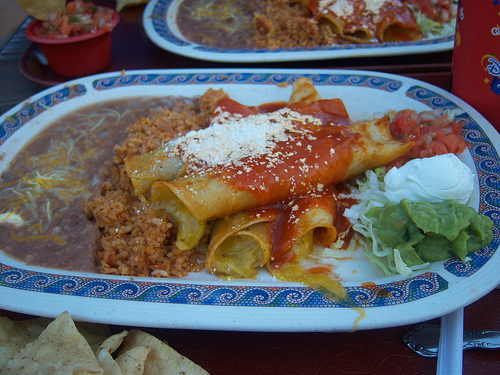 We both settled on the Red Chile Enchiladas. I won’t deny the plate looked quite lovely, bursting with color and attractively arranged. But as we ate (rather warily, might I add, since it’s hard to trust a place that puts forth dirty utensils), most it the food was not matching the surroundings. The rice was dry and crunchy, for the most part, bringing back memories of the old grade school cafeteria. The beans were a bit soupy — I thought this was a stylistic choice, but if you want to be authentic, how about tossing in some lard while you are at it. The enchiladas were above average, but had clearly been sitting around too long — they were a bit dry, and took a bit of effort to navigate through. I will say, however, the salsa was quite good. My advice to you is to get food elsewhere and eat in the lovely garden. I think this is one of the finest eating areas in the park. The food, on the other hand, is pretty pedestrian. Oddly enough, I had horrible Mexican food — some of the worst I’ve ever had in my life — over at California Adventure. Don’t you think we could get something a little more acceptable in this part of the country? I mean, I know it’s theme park food, but it really should be better. My sentiments exactly, Kurtie! I think a “C” is a fair grade…the food and service would have gotten a “D,” but it is a nice place to sit and eat. Try the Pacific Wharf Cafe over at CA. They have site-baked Boudin sourdough bread bowls of salads and soups, and scarily large bakery desserts. A++ all around. Heather, we have vowed to eat at every restaurant they have over the course of the next year. I definitely look forward to trying your suggestion. I’m crazy over good sourdough… and who can say know to a large dessert? I agree with Heather. Pacific Wharf Cafe rocks (although I am bummed that they took the Newport Nicoise salad off the menu, I’ve found that the Shrimp Louis is a very good substitute). You should have known better than to get enchiladas, either here or at that terrible place in DCA. That’s always going to be a disappointment. I don’t know if they still do this, but at one time, the Rancho del Zocalo had two stations – Mexican and Barbecue. I always opted for the Barbecue, because it was pretty good. It’s been a few years since I’ve been back, however, so I don’t know if the set-up is still the same.